Top luxury beachfront apartment. Three bedrooms with en-suite bathrooms. Exceptional location. Fabulous rooftop pool. An excellent housekeeper/cook at the guests' service. Our two apartments, AMARANTH 1 and AMARANTH 2, occupy the first floor of a modern building built on the beach in Pereybere, 1.5 km from the center of Grand Baie. The apartments are nearly completely identical. Both have three bedrooms with ensuite bathrooms. The lounge and the master bedroom of both the first floor apartments provide guests of the impression of living between sky and sea in the beautiful colors of the lagoon. The ground floor of the building is shared equally into two other identical apartments. One is a secondary home reserved for the exclusive use of the owners. The entire surface of the roof is landscaped and includes a swimming pool, which slates seem to reflect the colors of the lagoon. There are several sun loungers, parasols and a shower room. The view of the iconic Coin de Mire, one of the Islets of the north of Mauritius, is animated by a constant ballet of boats of all kinds. I am a close friend of the owner of these apartments. I own personally 3 holiday villas in Mauritius and I occupy my time renting them to holidaymakers. I also manage the rental of several villas belonging to our family and to close friends, the payments being made to the respective owners. This occupation keeps me active and allows me to socialize with tenants worldwide. I am the proud father of four daughters and the eldest is the one who is with me on my presentation photo. I am a retired Managing Director. My ancestor on the side of my father landed on the island in 1762 and, on my mother's side, I am the eldest of the descendants of the English officer who conquered the island in 1810 from the French. I look forward to the pleasure of welcoming you in Mauritius. See you soon! Francis Masson. I manage only exclusive rentals. These two apartments are truly outstanding. The roof-top pool is amazing, unique in Mauritius. The location of the apartments in Pereybère, 1 kilometer from Grand Bay center is perfect. There is no better value for money in Grand Bay. toilet, tub, shower, En-suite to master bedroom. toilet, shower, En-suite to guest bedroom. Three bathrooms ensuite to the rooms. One with bath and shower. all with WC. Ultimate luxury beach-front apartment. Very comfortable. 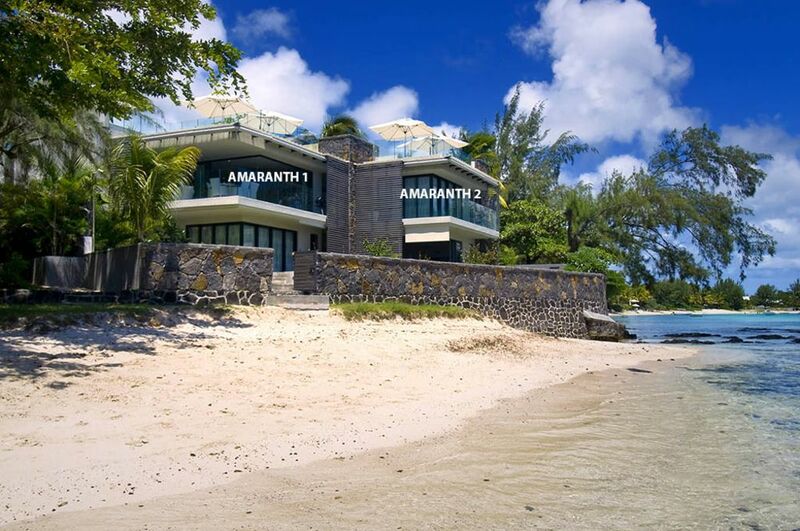 Situated in the best holiday resort of Mauritius. Fantastic roof-top pool, unique in Mauritius. Perfect for a totally relaxing idyllic holiday. Les prix comprennent les services de la femme de chambre/cuisinière présentesdu lundi au samedi à l’exception des jours fériés. Heures et prestations définies sur notre site privé " www.locations-villas-maurice.com '' Un tarif discrétionnaire pour les enfants de moins de 4 ans dépendant du nombre. --------------------------------------------------------------------------------------------------------------------------------------------------------------------------------------- The prices include the services of the cook/maid present Monday to Saturday, bank holidays excepted. Terms and hours of service on our website '' www.villas-rentals-mauritius.com '' A discretionary rate for children less than 4 depending on the number.